The Great Pyrenees is a breed of large, fun, affectionate dogs. They love to be with their family and owners but are not quite as warm to strangers. Having been used mainly as herding dogs in the past, instinct makes these dogs typically a bit more awake during the night, and sleepier during the day. These gentle giants are a great addition to most families, their intelligence and independence almost makes it seem like having another person in the house. These dogs are smart, as they were supposed to be able to act fast and independently. Unfortunately, their intelligence can make training a bit of a hassle. They will prefer to do their own thing most of the time, yet remain loyal all the same. The Pyrenees are also known for having stubborn streaks, so they require a somewhat experienced owner to command their respect. These dogs are comparable to giant, moving teddy bears with their treatment towards their owners. This fact makes them great for kids, who not only are big fans of teddy bears but are also often running around while making loud noises. This dog breed is calm enough to handle such chaos, and they are also most comfortable herding smaller creatures around. Young children are, of course, at risk, due to the dog’s large size, so they should be watched when interacting. Kids should also be taught right off the bat what not to do when handling the dog as well. That giant teddy bear treatment? It’s pretty exclusive. The Pyrenees is known for its loyalty to its owners, which also makes it notoriously inhospitable towards strangers. Most of these dogs will allow strangers so long as their owner seems comfortable with their presence. These dogs require extra socialization to make them less anxious around strangers. Want a Very Smart Dog? Be careful what you wish for. Highly intelligent dogs not only need physical exercise, but a mental workout daily to keep them from being bored and acting in strange ways. Many of these highly intelligent dogs do well if given a job such as being a therapy dog or working in obedience /agility. If nothing else works, provide some stimulating toys to keep their brain's neurons firing. Puzzle games and kong toys work well for this purpose. A Pyrenees functions best when they have a large amount of territory in which to patrol and explore. If your property does not suit its needs, it may try and spread its area. It’s recommended that you have an enclosure to prevent the dog from getting a bit Napoleonic over a neighbor’s lawn. An invisible fence won’t do. Only a sturdy, tall fence can contain a dog of this size. The Great Pyrenees is notorious for its vocal personality. They have very sensitive ears and are aware of the slightest disturbances. If they become aware of them, they’ll make you aware of them soon after. But they are not considered to be a yappy type of dog. Despite their independent personalities, Pyrenees can become dependent on their owners. They are better than most dogs when left alone, but may still indulge in some bad behavior if left alone for too long. They are more likely to bark more than anything when separated, so they may not be the best option for an owner who is gone most of all day. 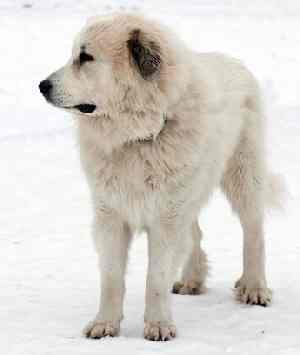 The history of the Great Pyrenees is hinted at in its name. 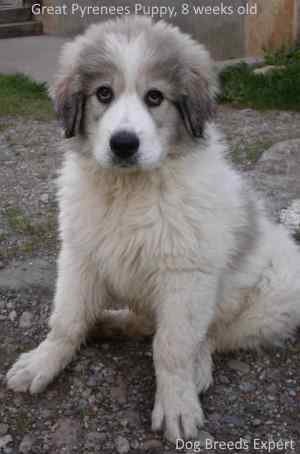 The breed originates from the Pyrenees Mountains in southwestern Europe. While the breed is from Europe, it’s likely they have roots farther east, in Asia Minor. These dogs probably made their way into Europe around 5000 years ago, traveling as they guarded flocks. Guarding herds being the job they did best, these dogs held a significant role in society. They were popular among the peasants for the most part but later became very popular among the nobility. In France, this special recognition saw its height when the Great Pyrenees was named Royal Dog of France during Louis XIV’s rule. The breed’s popularity among the French royalty made it famous throughout parts of Europe. The Pyrenees was gaining fame quickly, leading its population to increase as well. These dogs soon had a decent foundation in Europe. It wouldn’t be long before they made their way into the new world. 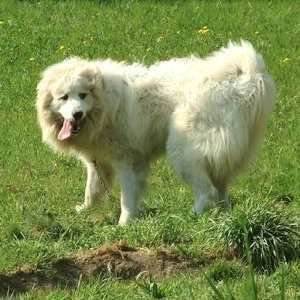 The Pyrenees breed made its first appearance in the Western Hemisphere in Newfoundland. In 1662, they were brought on fishing boats to the new continent, where they bred with the native Newfoundlands to create the Landseer. These dogs arrived with the French General Lafayette in the US a while afterward in 1824. While they became even more popular in Europe during this time, the breed remained unstandardized for a while. The World War 1 had a drastic effect on dog breeding around the world. Since almost every European country was involved and focusing all efforts on the war, breeding just wasn’t a priority. After the war, it was even harder for breeders, as Europe was in shambles and economic ruin. Many breeds saw their populations shrink, although, many Great Pyrenees managed to be imported into the US during this time. They never saw themselves threatened with extinction. World War 2 had a similar effect, although, the Great Pyrenees was not at significant risk due to its foundations in the US. Other breeds were not so lucky. After the war, the tide began to turn, as the US’s economy allowed for people to afford a higher quality of living. There’s no higher quality of life than living with a dog, so many breeds saw their numbers begin to go back up. The Pyrenees continued to gain popularity in the US up until the 2000s. The breed is relatively less known now, as it currently holds the ranking in the AKC as the 73rd most popular breed in the US. On the contrary, it remains a pretty popular breed in Europe. The Great Pyrenees is notoriously difficult to train. The main problem lies in the dog’s independence. Their instinct and intelligence help them act independently, so they typically need some coaxing for them to do what you want. Beginner owners might want to look elsewhere, as this breed may take charge instead. Housebreaking does not usually present much difficulty since these dogs are often well behaved and reserved. Owners will often take their dogs to obedience classes to make the training process easier as well. It is important for all dogs to be socialized at a young age, but especially with the Great Pyrenees. Their suspicious instincts make them wary of anything unusual. They are not recommended for areas of high population density, whether it be people or wildlife, as it only makes for more things to bark at. Taking a dog on frequent walks can help it become accustomed to its environment and less anxious about things that are odd. It is important for all dogs to be socialized at a young age, but especially with the Great Pyrenees. Their suspicious instincts make them wary of anything unusual. They are not recommended for areas of high population density, whether it be people or wildlife, as it only makes for more things to bark at. Taking a dog on frequent walks can help it become accustomed to its environment and less anxious about things that are odd. The only coat color registered by the AKC for this breed is white. They are considered to be a seasonal shedder which means the shed twice a year. During their period of shedding daily brushing is recommended. Owners recommend bathing these dogs when needed, as excess bathing can damage their coats. The Great Pyrenees is one of the few breeds that have double dewclaws on their rear legs. It is suspected that they needed them to help them climb steep cliffs when the breed was first developed in Southern France. It is important to brush a dog’s teeth too. It won’t make too much difference to how their breath smells unless you’re brushing daily, but it will promote good dental health. Dogs can build up bacteria, plaque, and tartar if their teeth are not cleaned, which can lead to pain and infections. Many owners will brush their dog’s teeth at least 2 or 3 times a week. All dogs will need to have their nails clipped. When a dog’s nails get to be too long, they may become uncomfortable or painful. To prevent this discomfort, owners usually cut their dog’s nails when they start getting too long, usually around every 3 weeks. The Great Pyrenees has an extra pair of dewclaws that need clipping as well. A good way to tell when a dog’s nails are too long is if they can be heard clicking against the ground as they move. When it comes to security, you can’t go too wrong by going for the Great Pyrenees. These large dogs can carry an intimidation factor so they might make someone think twice about trying something. Their size is backed up by their strength, making them capable of knocking down intruders, if put in harm's way. While their size makes for an excellent guard dog, you’d probably hear the intruder coming before it would even matter. These dogs are vocal about anything that seems off to them and is instinctively suspicious of strangers. Beyond people, the Great Pyrenees will seemingly bark at almost anything that moves in the whole neighborhood. They are known for their impressive hearing, which assisted them when guarding herds. 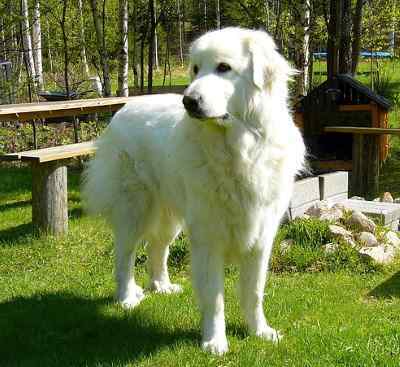 The Great Pyrenees has the ideal mentality for a guard dog, in the way that they are incredibly loyal to their owners. This loyalty is paired with the breed’s protectiveness of its territory, making them especially suspicious of anything unusual. While this trait is handy when protecting your property, it can become a nuisance when having guests over. The dog has to trust the owner’s opinion to allow foreign company. Dogs, unfortunately, do not have universal healthcare. This is bad because they get sick and injured just like humans do. It is vital to be able to provide the adequate healthcare for a dog when getting one. It is also important to know the sorts of health risks associated with a certain breed, as some breeds are more prone to certain issues than others. It is also important to find a reputable breeder when purchasing any breed. A good breeder will know a lot about their breed, and be able to pass health checks for it. Read what it is really like to live with a Great Pyrenees Dog.